The annual slide into Christmas has begun, and this week I found it hard to do anything other than lie on my sofa watching terrible old movies and stuffing my face with chocolate. When I finally got myself to sit down at my desk, procrastination levels were high (you might notice this is about the sixth theme my blog's had in two months). To knuckle down, I tried the Pomodoro technique on the advice of my friend Kim. It involves setting a short period of time and letting it count down on a timer, until you're allowed a five minute break, to check your emails, go to the loo, tag a few photos, whatever. And then it starts again. I set the timer to write for bursts of 25 minutes followed by a 5 minute break, but found I was often in the middle of things and didn't want to pause at the end of each 'Pomodoro', and ended up stringing three of them together, not coming up for air for an hour and a half. That's my usual schedule. I find my mind wanders after about one hour 25 minutes of writing, however productive it's been and however pleased I am with the results. 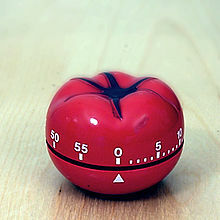 The difference with Pomodoro is that the time is ticking away on your toolbar. And it TICKS. Loudly, so you don't forget. It's regimented, but I did see results: I wrote faster, and hesitated less. That said, on Sunday I gave myself a break and leisurely read back some notes I'd made, to see if any were worth writing long-form. Some were, and I wrote passages that float in time and space - I've no idea where they're going to go in the narrative, but I had fun with them, and they fleshed out a few characters other than my main one, who I've started to realise is a bit of a limelight hog, and the book won't work if more isn't made of the other characters. I didn't write as much or as fast as I had on the Pomodoro technique (that really sounds some awful diet, doesn't it? ), but I was more pleased with the results. They expanded on a few thoughts that so far have nestled in my brain, popping out only when they're absolutely sure I don't have a notebook on me, staring at the grim, slushy Walworth Road out of a bus window, say, or nodding off at night. Which bits will get cut? Hard to say. The hard-fought passages might sometimes fill the word-count for he sake of it, but they also contribute (I hope) to a core story, whereas the more flighty ones might just be the darlings writers are so often implored to kill. The only way to find out is to crack on til the end.